Book five in the series was my least favorite. While it did help progress the story in the overall war against the evil vampires, the declarations of love between the two main characters felt rushed and unbelievable. Considering the two were absolute strangers, and that “Renata” continuously attacked Nicolai, their quick and unconditional acceptance of one another seemed dubious at best. Mind you, when it came to declarations of love, Nicolai had it, over all the other men in the series, hands down. WOW! If I had actually “bonded” to the couple in this story, I would have absolutely melted over his romantic professions to her. 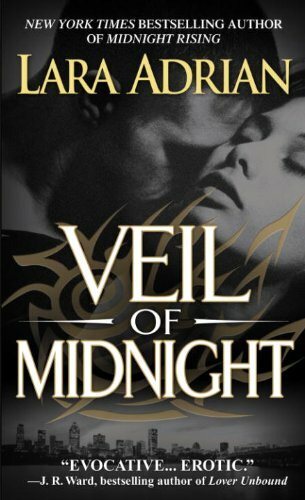 Nicolai is sent from The Order to Montreal to contact a first generation vampire, Sergei Yakut and warn him of the recent slew of Gen One’s being targeted for murder. Nicolai is attacked by Renata (Yakut’s unwilling servant/Breedmate) and then thoroughly rebuffed by the very Gen One they are trying to warn. However Nicolai eventually manages to garner an invite to stay with Yakut and his crew for one night (to further his investigation). While there, Nicolai uncovers gruesome details about Yakut. A brutal tyrant with a volatile temper, he shuns all vampire laws and partakes in banned human killings for blood. All who serve him (including his Breedmate, Renata) do so through fear. Nicolai also encounters a young child (also a Breedmate) who’s gift is that she is an oracle, and can show you the future simply by staring in her eyes. To his dismay (and excitement) Nicolai realizes that his future will include an intimate encounter with Renata. It didn’t take much to conjure the image back into his head. Oh, hell no, not much at all. That picture was as good as permanently burned into his memory and all of his senses. Despite his animosity towards the aggressive Renata (her gift is that she can attack vampires mentally, and has done so repeatedly to him), he returns to retrieve her from her dangerous environment. Back and forth, events arise where, one is forced to rescue the other, until the inevitable happens, they fall in love. While the enemies are rampant in this book, (from Yakut, his son, and those they alliance themselves with, to the true evil that intends to rule all vampires, and humanity), the “good guys” find themselves knee deep in in turmoil, danger, and new revelations. One of my favorite moments in the book, actually involved Reichen (from Berlin) and his human (not Breedmate) lover Helene. They had been lovers for the past year, a casual dalliance that had somehow turned into something deeper if not entirely exclusive. Reichen knew Helene had other men in her life – human men – as he also occasionally took his pleasure with other women. Theirs was not a relationship plagued by jealousies or possessiveness. But that didn’t mean it was devoid of affection. They shared a mutual concern for each other, and a bond of trust that extended beyond the barriers that generally made human and Breed relationships impossible. It was interesting to see their private moments, and their deep affection for one another, despite their unconventional arrangement. And while things go crazy in Nicolai’s world, Reichen’s proves to be even more devastating. While The Order discover that those in positions of trust are not always what they appear, they are also surprised by the unlikely support they manage to garner. Objectives and priorities differ for the “good-guys” (Nicolai wants to save Renata, Renata wants to save Mira, and The Order want to save the race), so the ending is actually quite exciting. Who wins? Read it and find out. While it didn’t keep me up reading into the wee hours, it is a great stepping stone for the next in the series (which DID keep me up). depends on Renata’s obedience. I instantly found connection to her coz it reveals her compassionate character. They both live in fear and random beatings if she refuses to follow orders. Sergei Yakut lives in his own terms. He (thinks) doesn’t need any alliances, especially protection to fight off the Gen One Killers. Why? Well he has built a kingdom of his own. He has his own bodyguards. Highly trained warriors vamp plus powerful Breedmates. I was so focused on the concept that The Order is trying to protect the vampire community and the humans versus the Rogues are the enemy. I forgot the possibility that there are certain exemptions in every species. You might be a Gen One leader but you could act corrupted and be more likely compaired to the activities of the Rogues. I hate him because of how he treats Renata and Mira. Grrrh! Nikolai is a weapons specialist of the Order and an unbeatable fighter. He was sent to warn Yakut for the plot to kill all the Gen One vamp. But later he found out that yakut is corrupt and he is better of dead.His desire for Renata was emotionally compelling. And I was touched at the part that Mira called him Dad in the end. nice to refresh our memory with them. And look forward for the next book.